How many of you store all your connectors and coaxial adapters in one large box? After years of dealing with the jumble of connectors and adapters and the wasted time in pulling out what I needed, I finally decided to make this part of my “spring cleaning.” After rooting around multiple locations for small stashes of these connectors, I cleared off the workbench and sorted them all by size and type. I also decided to collect and sort all the small coaxial connector-related modules, such as combiners, power splitters, amplifiers, etc., as well as other small everyday electronic sub-assemblies I routinely use for experiments. Once all the various components were sorted out, I paid a visit to our local Walmart and found these five-drawer units (8-1/2″ x 7-1/4″ x 11-1/8″, model 2075) made by Sterilite, which were just the right size to hold the multitude of connectors, adapters, and modules. The drawer modules are stackable, so I can double the storage pretty easily, if required. Because the drawers are clear, I can see at a glance what I need. I recently upgraded my old Radio Shack AM radio, which I used for ESD detection, for the Grundig (Eton) Mini400 AM/FM/SW pocket radio. This $30 (street price) pocket-sized radio (4.25 x 2.75 x .5 inch) seems to have plenty of sensitivity to nearby ESD events. By tuning off-station, you can clearly hear the “clicking” from the ESD from several feet away. Using one of these radios is handy for correlating random product glitches with possible ESD events. I’m also finding it’s quite useful in locating low frequency switch mode power supply (SMPS) EMI. The shortwave bands are especially sensitive to this noise. For example, the CFL and newer LED lamps each have a SMPS built in to their bases. The multitude of these lamps in homes today can create a cacophony of EMI well above the shortwave spectrum. This is a real issue for amateur radio operators and those who enjoy radio astronomy. The radio has an analog tuner with digital display. It runs on a pair of AAA cells and seems to have plenty of audio. It also comes with a padded case with belt loop. The only caution I might point out is that the power switch is a momentary button, which could get pressed inadvertently if pressed during shipping or if packed tightly in your troubleshooting kit. The radio does have a “Lock” switch on the side that disables the power button, so that ought to alleviate that issue. You just have to remember to unlock the radio prior to use. I bought mine from Radio Shack for $40, but you can find one on Amazon.com for $30. Recommended. Thanks for all the great questions presented following my recent EMC webinar, sponsored by Rohde & Schwarz and hosted by UBM TechOnline. If you missed the webinar, you may go here to download a copy of the slides and listen to the webinar “on-demand”. As I mentioned in the previous three postings, I’ve grouped them by topic and will be answering them all the best I can. Be advised that for many questions pertaining to EMC, the best answer is, “it depends”, so there may not be one answer for all cases. I’ll try to include my assumptions in the answers. The questions have been edited for clarity. The annual IEEE Symposium on Electromagnetic Compatibility (EMC) was held August 5 through 9 at the Denver Convention Center. EMC engineers and EMC-related vendors from all over the world met to present the latest technical information, as well as the latest products and services. Please go here, for the whole article. 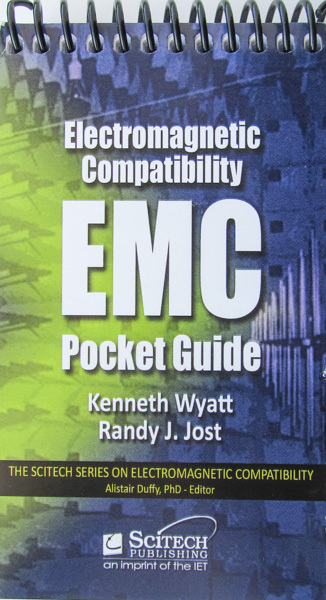 Randy Jost and I just released our new EMC Pocket Guide, which includes some basic product design guidelines and a whole bunch of reference data, charts and graphs that a product designer or EMC engineer might require on a day to day basis. The guide is available directly from the publisher, SciTech Publishing, for a special price right now of just $20 (regular price is $21.95). I’m not sure how long this special pricing will be in effect, so you may want to order a copy now. Every electric product designed and manufactured worldwide must meet electromagnetic compatibility (EMC) regulations, and yet, EMC compliance staff levels have been cut to the bone in companies large and small. If you are a working engineer or technician, the Electromagnetic Compatibility Pocket Guide is the first place to look while designing for EMC and your guide to thwarting electromagnetic interference. * Concise, constant-use guide addressing the most common reasons for compliance failure. * Get needed answers quickly and move on to other design issues. * Pocket-size, easy to carry and use, made of durable stock for continual service. * Available for customization with your logo and marketing copy if you order in quantities. Following the recent webinar sponsored by Rohde & Schwarz, I received way too many questions to answer during the live presentation, so I’m following up gradually and posting my answers on The EMC Blog, now hosted by EDN.com. I’ll be posting more soon on general EMC topics and pre-compliance testing for radiated emissions. Here’s a question from the last EMC webinar regarding “stitching capacitors” – what they are and how they’re used. While I attempted to answer the question during the Q&A session, things seemed a bit rushed, so here are some details. A stitching capacitor provides a path for return current to flow back to it’s source. The capacitor would connect between the ground plane and power plane and must be located adjacent to where the signal trace changes reference planes. If the two planes are at the same potential, you only need to connect them together with a via at the place where the signal trace penetrates. Here’s a couple slides form my seminar that diagrams the issue. You can also run a ground trace (signal return trace through vias to do the same thing. Figure 1 – Here’s one of the most common issues from a slide taken from my EMC design seminar. If a clock trace needs to penetrate through two planes, how does the return current get back to the source? If the two planes are the same potential – for example, signal return planes – then you can merely connect the two planes together with (typically two, or more) vias on either side of the clock trace. However, if the two planes are different – for example, signal return and power – then obviously, vias would not work, so we replace them with high-frequency bypass capacitors – i.e., “stitching” capacitors – on either side of the clock trace. Unfortunately, connecting each side of the capacitor to buried layers will require multiple vias, so to keep lead/trace inductance as small as possible, the vias must be located so as to minimize trace length and should be located as close as possible to the source clock trace penetration. Stitching capacitors may also be used to provide a high-frequency connection across isolated planes, but this is a more advanced technique we can discuss at a later time.